UX management for Dell S520 | Product Development | UX Lead | 2013 - 2015 | Generative & Evaluative Research. Design Iterations. Dell Interactive projectors help engage participants and enable collaboration. allows users to interact with the projected image using a stylus or touch. personal devices and shared display together. from Dell, moving the interactive solution from pen based to touch. critical to Education customers from all grades and geographies. capable products by delivering interaction (touch) to corporate collaboration. The development model in place meant that the UX lead would take a consulting role, advising and providing recommendations to modify what the vendor is building. I led the UX efforts through the development phase till launch. My priority then was to make sure key product experiences are satisfying to the end-users. When there's design decisions to be made, I provided recommendations from a UX point of view, and I would follow through the implementation, working closely with the development team. I made it a point to ensure alignment between internal and external stakeholders from marketing, engineering and vendor development team based across US, Taiwan & Singapore. After launch, I have been working with marketing, engineering, service, and external vendor to drive for improved customer experience in setup, use and support for next generation planning. The projector business runs with a small team, it's common for members to wear a few hats. It has been relying on vendor resources greatly, and the design seat has been left vacant for two three years. The S520 solution features multi-touch capability and Intel® Wireless Display technology. These are introduced in 2014 into Dell projectors portfolio to enhance creation, communication and collaboration in classroom and meeting room environments. When I was brought into the projector team, the S520 program was in the early development phase -- what was to be built has already been defined, product goals and features have been determined too. The S520 was a complex program for the projector team on a few levels, attributing to it being new, unique and different, necessitating skilled planning, execution and coordination. Ensuring user satisfaction from setup to use, I kept a closer watch on key product experiences, around setting up and using wireless projection and touch. I also drove for modifications in system behaviors, hardware and software interface to communicate the Dell 'look and feel'. I focused on touch points that were new or unique to Dell. Working closely with the vendor engineering team, I led, managed and keep tracked of design iteration efforts to refine product experiences of new technologies and features offered in the S520, while influencing with a lighter touch, where the vendor was leading the efforts instead, in projection features which they would have more rigor and expertise. I drove for consistent system behaviors, hardware and software user interface design. This meant a user powering on or off a Dell projector, switching from one input source to the other or adjusting the controls of the projector from the On-Screen-Display menu, would have a consistent and familiar experience using any Dell projector or other Dell products. It also meant that when the projector has low lamp life or has overheated and users try to get help, they will be referencing warning signals that are consistent across all Dell projectors. These ensure long term brand consistency and efficiency for both customers and Dell. Once a first prototype build was available, I flew in for a 5-day design review workshop with the vendor's project management and engineering teams. Open items were documented and tracked to ensure alignment and execution rigor. Later, back in Singapore, I ran a usability test to validate the 'beta' touch solution. This resulted in further improved accuracy, control and smoother ink strokes. After product launch, I led benchmarking efforts to measure the S520 against competitors. Besides competitive usability evaluation and expert review, on-site observations and interviews were also conducted to gather a holistic perspective. The exercise identified areas done well and gaps for the team to address. Findings from the body of work translated into action items for near-term improvements and insights that inform future planning. Instructions were incorporated into installation UI, so installers don’t have to refer to printed instructions manual. Step by step, wizard style UI is implemented to guide installers through the calibration process. The S520 solution consist of a solution manufactured by various vendors. This led to each coming up with their own set of instructions for their own parts, and the outcome of that, was a fragmented installation process for the customers. User Documentation, hardware and software user interface were refreshed and aligned to Dell Brand standards, delivering a consistent Dell experience that users would be familiar with. 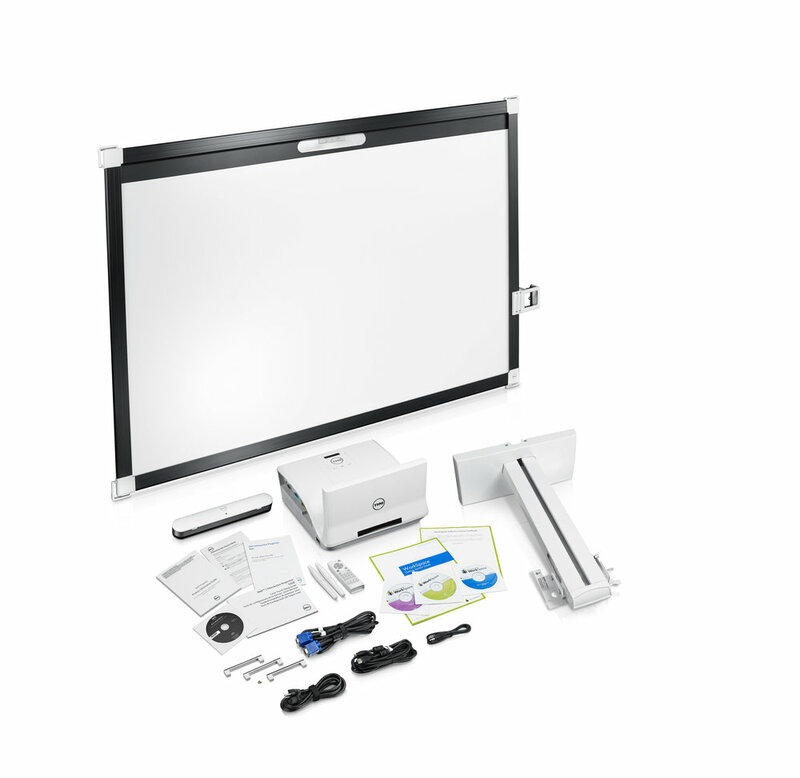 The S520 consists of an ultra-short throw projector, wall mount, 87-inch screen which doubles as a whiteboard, interactive solution kit, stylus and accessories. A working prototype wasn't as readily available compared to other standalone, smaller products. Once it was available and installed in the Singapore office, it was critical to get useful user feedback and data to the development team so refinements can still be made in time. I ran a quick usability test with internal participants, instead of a full fledge, formal usability test, considering time constraints. The point was doing enough, the fastest possible way to gather useful data. Learnings from the usability test helped drive for a best-in-class touch experience. Competitive Usability Study to evaluate how S520 fares against competitions in areas of its usability and overall usage experience from a user’s perspective.